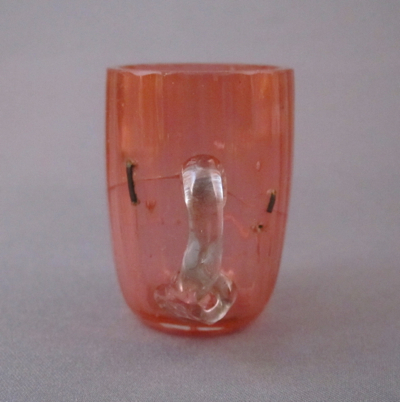 This diminutive hand-blown ribbed cranberry glass punch cup has an applied clear glass handle and polished bottom. 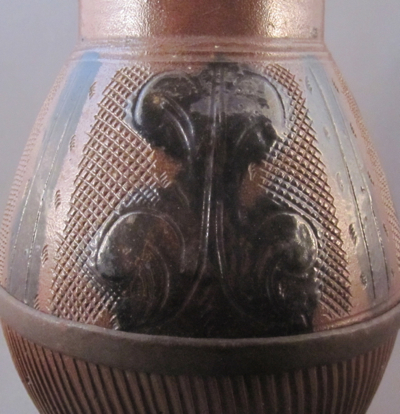 I purchased it about a year ago from a dealer in the UK who thought it was made in Bohemia around the turn of the 19th century. 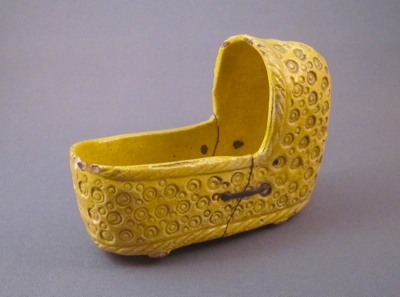 Standing just a mere 1-1/2″ tall, it is one of the smallest examples in my collection. 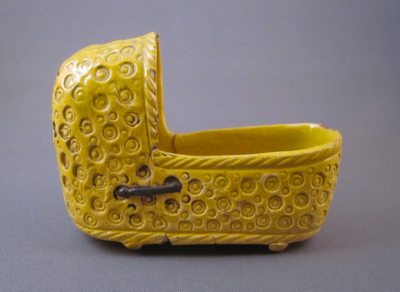 It would have been a part of a larger set, including a punch bowl, ladle and up to 12 matching cups. 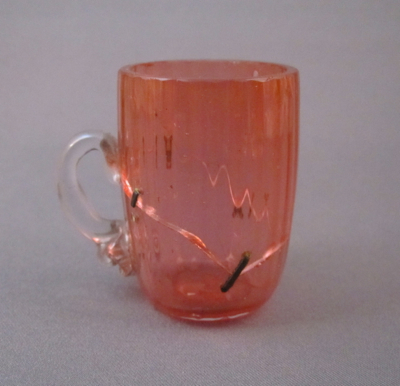 After this cup broke, a tinker very carefully bore eight minute holes through the sides of the glass, using a drill bit covered in diamond dust, and attached four 1/4″ long metal staples. 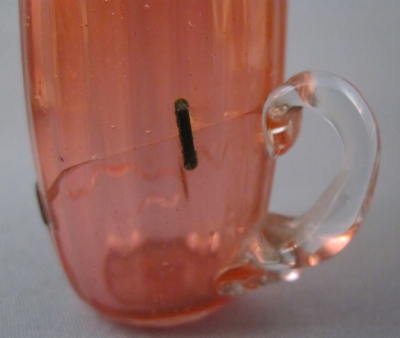 These are some of the smallest staples I have ever seen. 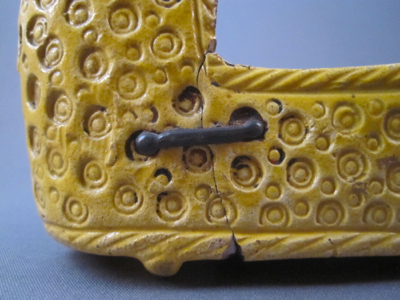 It must have taken nimble hands and years of experience to repair this tiny gem. 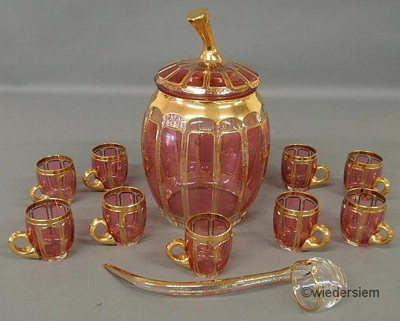 This elaborate cranberry glass punch set with gilt decoration, made by Moser, would originally have had a dozen matching cups and an undertray. 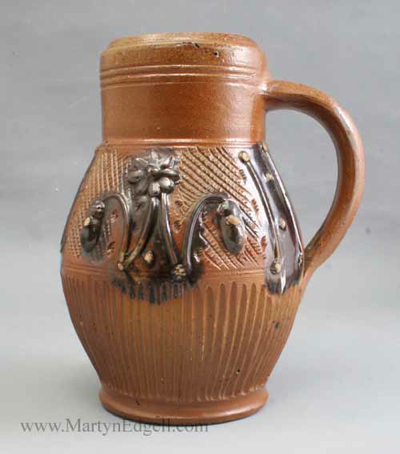 This rustic brown stoneware jug with ovoid body was made in the Muskau region of Germany in the mid 1700s. 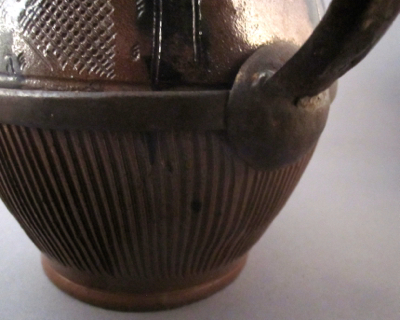 It is decorated with incised stylized foliate against a crosshatched ground above vertical fluting and black glaze highlights. 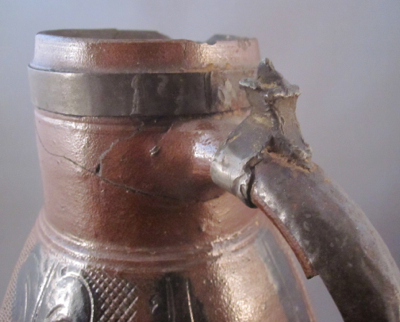 Remains of the original stoneware handle can be seen beneath the metal replacement. 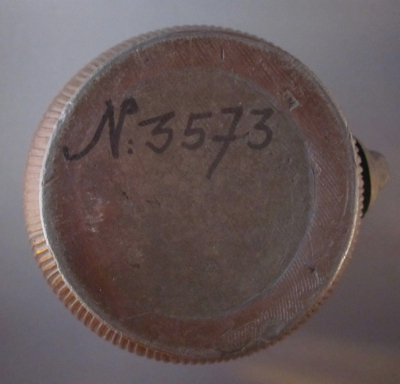 It is attached at the top to the remains of the pewter lid hinge and at the bottom using a horizontal metal band, blending in nicely and appearing to be a part of the original design. 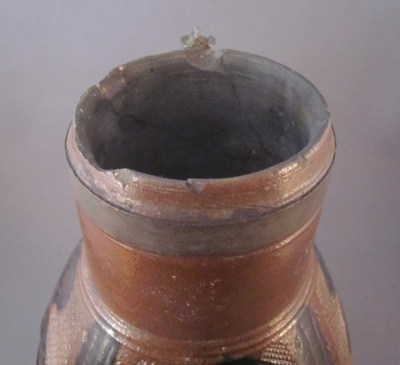 An additional horizontal band around the neck helps to stabilize the multiple cracks beneath. 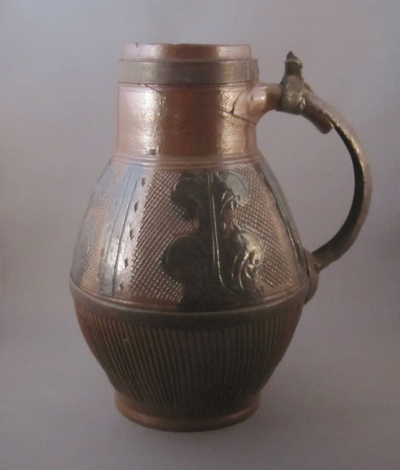 The original pewter mounted lid went missing long ago, which is not uncommon for a much-used flagon of this age. 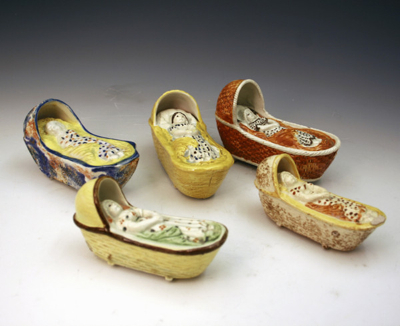 It measures nearly 9-1/2″ high. 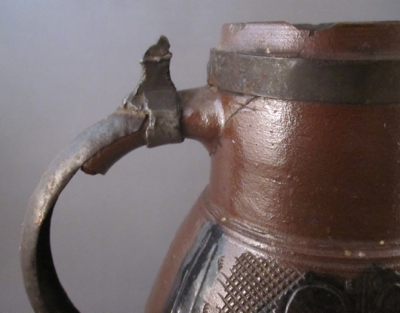 This fine example has its original handle intact and shows what mine would have looked like before it broke and was brought to the local tinker for repair. 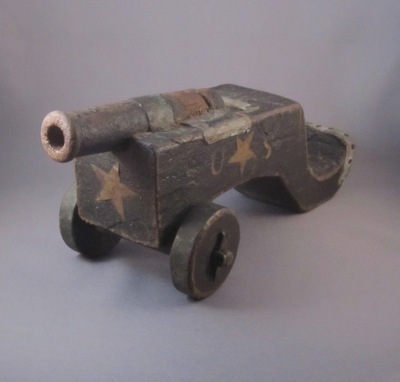 This is the last and largest of the three cannons I purchased as a lot last November. 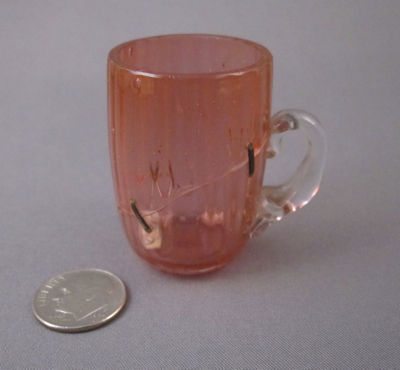 It measures 12-1/4″ long, 4-3/4″ tall and I believe it was made in America in the late 1800s. 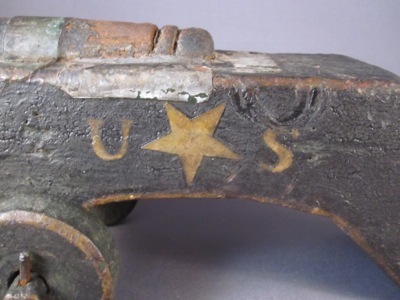 When a young boy played a bit too rough and broke the toy cannon one Fourth of July in the early 1900s, I imagine his handy dad or grandfather carved a wood base to replace the broken cast iron original, adding embellishments such as paper stars and the letters “U S” to its sides. 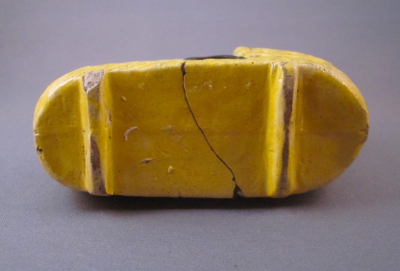 The barrel, with remains of the original black surface, sits on a metal plate and is fastened to the wood trolley using metal straps. 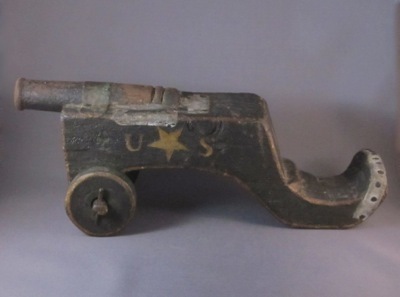 The carved wood wheels are connected to a wood axel with metal pins and a strip of tin edging is attached to the back tail using numerous nail heads. 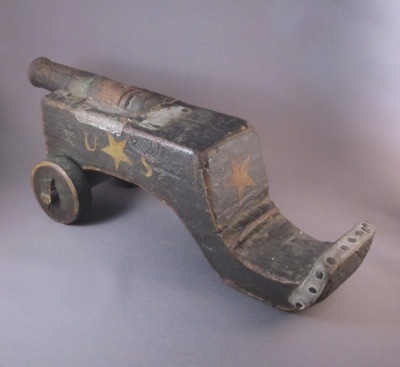 I love the original dark green painted surface with gold trim and alligator finish, consistent on all three of the cannons, suggesting that they were repaired by the same person or at least in the same household. 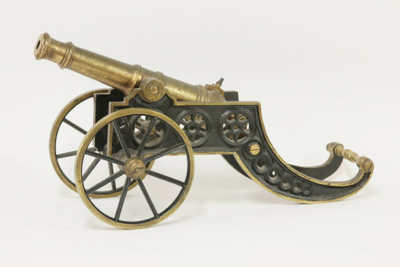 Please take a look at these other two posts, including a small and a medium-sized cannon, which make up the remainder of this terrific trio. 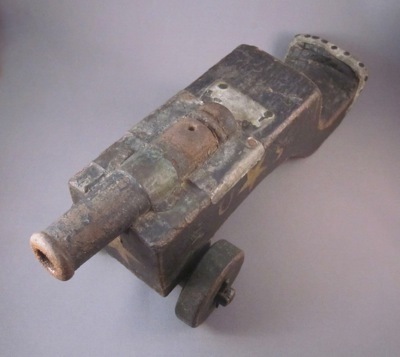 This intact bronze cannon with fanciful trolly shows where the inspiration came from for the carved wood base on mine.